As I held my eight month old son, Connor, in my arms, I found myself staring at the floss-like-string that was attached to his tongue and taped to the outside of his cheek to keep him from swallowing his tongue after his palate was repaired. My mind drifted away and I began thinking about how fortunate we were. Connor’s 2 1/2 year old brother, Jack, was keeping me busy at home and I was pregnant with Connor’s sister, Peyton. But, I could not have felt more comfortable, assured, and confident that Connor was lucky to be at Shriners Hospitals for Children-Chicago and he was going to have the most wonderful and healthy life that any parent could wish for. The nurses, surgeons, and staff went above and beyond in caring for every patient and parent in the Intensive Care Unit. The nurses were diligent about making sure both the parent and the patient had anything and everything they needed to feel safe and comfortable. The nurses and staff at Shriners were not only skilled and talented professionals, but were loving and caring men and women.The entire staff treated every patient as though it was their own child and every parent as though it was their sibling. The ICU at Shriners Hospitals for Children-Chicago was unique and different. After Connor’s surgery I laid awake with him and so many options crossed my mind as to what I could do to show my gratitude to the hospital and staff. The first Annual Shriners Scramble was conceived. My motivation was two-fold; first, to raise money for the hospital and second, to create awareness for families of children who need medical attention; the latter being the most important. The care that is provided at Shriners Hospitals for Children-Chicago is second to none. 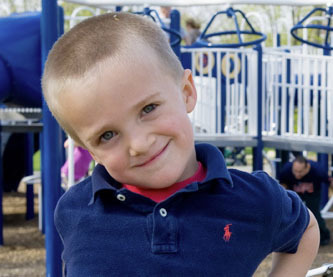 All care and treatment is provided to Shriner’s patients and their families at no cost! There are no worries about endless insurance battles and medical payments, which is a relief that no one could understand unless they have been in that position. To be able to focus all concerns, emotions, and energy on your child is best gift a parent could ask for. After four years of our golf outing, $71,500 has been gifted to the hospital! More importantly, we have created an awareness of Shriners Hospitals for Children-Chicago and hopefully eased the concerns of families in need of medical care for their children. There are twenty-two hospitals in the world, all specializing in a specific area of treatment to provide the highest quality of care for children. My family and I are extremely grateful for the support that our community and friends have given us in the past four years. Each year we have had a minimum of 200 golfers and dinner participants. Every year the success of the Shriners Scramble is due to the monetary donations, raffle, and silent auction items donated by so many individuals, businesses, the many volunteers, and friends that tirelessly give their time. I am excited about some new fundraising events in 2013, which will be announced at a later date. I look forward to seeing you at our final golf outing on June 22, 2012!